A moderate risk was in place for severe thunderstorms on the morning of 5-19 along a N-S oriented dryline in the Central Plains. We had been eying Sunday's setup most of the week, and our plan was to play isolated storms along the dryline in central OK, as models had been hinting at robust thunderstorm development in that area for multiple runs. Shear vector orientation (an important factor for storm morphology) was favorable in this area for isolated storms, and given the magnitude of the vertical wind shear (50+ kts. 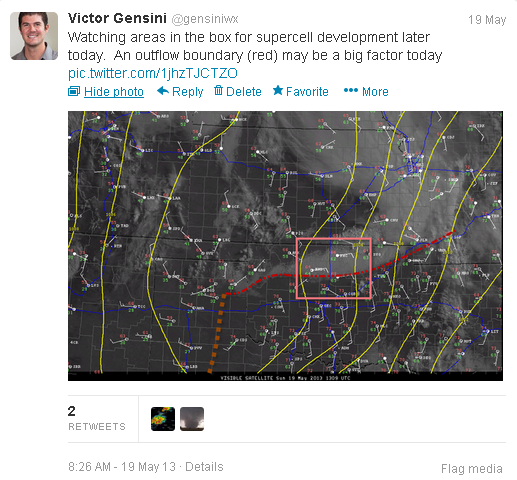 ), isolated supercell thunderstorms appeared likely. We awoke in Wichita and immediately noticed an outflow boundary oriented E-W in central OK from our "Coldwater Cold Pool" the previous evening. We slowly drifted S along I-35 before stopping in South Haven, KS at a nice park for a softball game (1-0 good guys!). After examining visible satellite for a couple hours and watching the 1800 UTC OUN sounding come in, we were excited that our morning forecast target may play out as planned. Towering cumulus began forming near Oklahoma City, and we quickly loaded up to head south toward Edmond, OK. The storm rapidly became a supercell before producing a tornado that hit Edmond (we watched a few power flashes as it moved through Edmond). What happened next was rather bizarre. While navigating east out of the bears cage, we stopped at a house with a very long gravel driveway to turn around and face the storm for a view. When it became apparent that the tornado was quickly moving toward this location, we dropped about 1/4 mi. south of this house and watched as it was struck! Thankfully, the damage did not appear to be too bad, and to my knowledge, the residents were unscathed. After the rope out stage of the Edmond tornado, a new (much stronger) mesocyclone formed to the northeast of Edmond. This storm had a much "meaner" appearance, and it was pretty evident that it was going to produce a large tornado...and it did. The motions in this tornado were *violent*, in fact, more-so than in the video that I have seen of the Moore, OK tornadoes on May 20th. 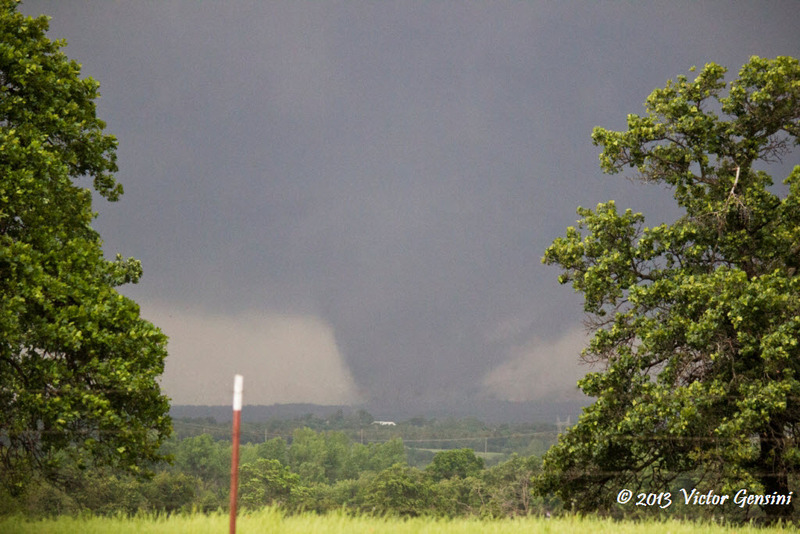 This tornado had at least one large horizontal roll vortex, and appeared at one point to be two large tornadoes rotating around each other. We stuck with this storm a little to long before dropping south to the storm that produced the Shawnee, OK tornado. By the time we got there, that storm had become outflow dominant, but still treated us to many beautiful crepuscular rays at sunset. We ended the evening in Tulsa, OK, celebrating our great chase day and Morgan's (trip participant) 21st birthday.